For me, writing has always been my passion- it’s figuring out to harness it that has made all the difference. I’ve always journaled, dabbled with poetry and incomplete song lyrics, and doodled quotes on fast-food napkins, but it wasn’t until I really challenged myself to do something more that I began this journey as an author. My writing has always been a private affair, hidden from the harsh critique of others. It’s personal and it’s mine; the thought of exposing it used to terrify me to the core. When I finally garnered the courage to put my work out there, it was life-changing. The good feedback was encouraging and delightful and reassuring. And you know what? The bad hasn’t killed me either. Of course I’ll never be Shakespeare or Poe or Bronte, but I am Taylor L. Stimac and I offer a glimpse of the world that no one else will ever be able to. I have the gift to share my perspective, to inspire, to take the calling that I feel inside of me and to do something with it. Given the chance, who wouldn’t jump at the opportunity? So, why do I write? Sure, there are lots of reasons, but the one I stick with: I write for me. 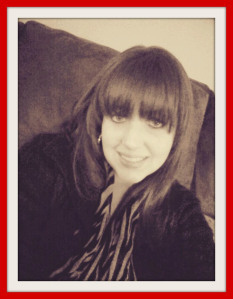 About the Author: Taylor L. Stimac is a Young Adult novelist with a passion for storytelling. She graduated from East Central University in Ada, OK with a Master’s degree in Educational Technology. She’s been an English teacher since 2010 but has since found that her passion lies in writing prose rather than teaching it. When she’s not writing, Taylor enjoys painting, listening to music, and crafting. She resides in Arkansas with her husband and daughter. When fifteen year old Tegan Summers catches the eye of local radio personality Rake Johnson, she finally feels like a normal teenage girl. Everything about their relationship feels perfect, except for the unexplained presence that makes her believe she should stay away. On the same day she meets Rake, another man makes his way into her life: Officer Damien Sanders. His mysterious and often intense warnings urge Tegan to trust him and to end her relationship with Rake. As she works to uncover Damien’s motive, she begins to realize that he may end up playing a vital role in her future. 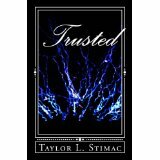 Discover what Tegan must do in TRUSTED, the debut novel by author Taylor L. Stimac. Would you trust a stranger? In the wake of Tegan’s apparent kidnapping, everyone is eager to get back to normal. Tegan, however, becomes determined to uncover Damien’s secrets and reclaim her sanity. The constant obsession with Damien begins to put a strain on Tegan’s newfound love life as Rake begins finding ways to cope with her behavior. A downward spiral has begun that may prove to be irreversible. Follow the journey as Damien’s secrets are revealed and Tegan discovers just what she is destined to become. Destined: Book 2 in The Trusted Series: What’s your destiny? “How’d it go?” Rake asked sweetly. My eyes sliced through him as his question was silently answered. “That good, huh?” he sarcastically replied as he fired up the truck. Internally, I was furious. The audacity of “Dr. Lang” (was she even technically a doctor? ), the sheer fact that both my parents and Rake agreed that I should be here. The entire situation made my blood boil. “Tegan, you get why you need to talk to someone, right?” he coaxed. I rolled my eyes as my hand instinctively pulled away from his. “Oh, so it’s gonna be like that,” he teased. His truck began to veer into the nearest parking lot and before I knew it he was present on my side of the truck, his forehead pressed firmly against mine. “l love you,” he whispered, closing his eyes as he planted a soft kiss on my lips to confirm his words. I swallowed hard, forcing the tears brewing in my eyes back down in defeat. “Love you too,” I whispered back nearly inaudibly. We held each others gaze for several moments as his eyes desperately searched my face. I knew he wanted to say something, I just wasn’t sure what. As my mind raced in several directions, his voice broke through. “Tegan, I was so scared,” he confessed. I stared at him blankly, puzzled by his admission. His voice trailed off, turning into short, painful sobs. Though I had never seen him cry before, there was a familiarity to his tears that I couldn’t shake. He didn’t dare say it. The unspoken fear of everyone since I had been found. “Rake, I’m here and I’m fine, okay?” I reassured him. His quivering lip matched the shaking hand that attempted to caress my cheek. Taylor has been kind enough to allow me to giveaway her books. One lucky reader will win an ebook copy of both novels and another winner will receive a paperback copy of both books. All you need to do is leave me a comment below saying you would like to enter the contest and if you don’t have an ereader, that way I only place your name in the paperback hat. Two winners will be selected at random on February 17th. Good luck! This entry was posted in Guest Posts and tagged Book Excerpt, Destined, Giveaway, Taylor Stimac, Trusted, Young Adult. Bookmark the permalink. 37 Responses to Why do I Write by Taylor L Stimac, Excerpt, and Giveaway! That about sums it up. If we write for someone else, even fans, we’ve lost what made us writers in the first place. I agree. It takes the heart right out of the story. Writing for others is a dangerous business and you risk losing your fans. Great post! Throw my name in please :). Ooh—I LOVE giveaways!!!! Sign me up, sign me up! 🙂 Headed over to Goodreads to add Taylor—-these books sound amazing as does she!!!! Thanks for sharing the author love with us. That’s very kind of you and I love your enthusiasm! It’s so much fun introducing new authors to my blogging buddies. I think that I write for other people more than myself at least publicly. I would never write something in a blog post for example that would hurt or embarrass my family. I just wouldn’t. One of the things that excites me about the idea of writing a book is the ability to create characters that can do or say as they please. Of-course, I’m not writing a book because of the pressing need to peel scotch tape off the ceiling and put the spices in alphabetical order. However, like you, writing is a part of what makes me. I like your answer. It’s perfect. Luckily for me, I only own salt and pepper so the spice job isn’t too overwhelming. However no one wants to eat my cooking, which explains why I only have salt and pepper. A wonderful and honest post. Love it. Did you want me to put your name in the hat? I have so many because I can’t say no but don’t have near enough time to read. I’m the same way, but I just can’t resist. I may have a problem, but I like this problem. If there were a Booklovers’ Anonymous, it would be crowded. I know. It would turn into a book club instead. yes! maybe we could all swap books as part of the therapy. Right up my alley. I’m all for THAT. Nope, this one is international. As for me, I read just about any genre, but I know many who like to stay within their comfort zone. OK, I’m in. No e-reader though so ’twill have to be the paperback writer. No worries! I’ll put your name in the hat for paperbacks. Good luck! That’s a good way of putting it. I’m the same way. People will ask and I stumble for words looking like an idiot and not like a writer. It’s not good and I need to work on that. I hope all is well and my thoughts are with you. Agreed. Writers write because they can’t not write. Yes! It’s a part of us. some are louder than others. I have one right now that’s driving me crazy! Thank you for the giveaway. I’d love to be considered. I write because I must. My characters and ideas won’t leave me alone.